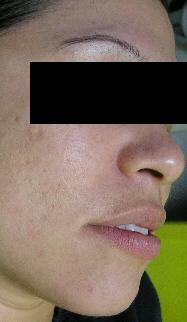 Photo-Ablative - See Laser Peel/Resurfacing below. A SAFE and EFFECTIVE way to soften or remove WRINKLES, SCARS, and DISCOLORATION from your skin. Laser energy, from the Venus™ Erbium YAG, removes the top most layer of skin. As the skin is regenerated, discoloration, wrinkles, or other marks will be diminished or in many cases eliminated. We can tailor the depth of the peel and recovery time to your individual needs by adjusting the laser's power settings. Some patients choose to have fewer deep treatments with longer recovery times, while others wish to have more light treatments with shorter recovery times. Many facial conditions such as fine wrinkles around the eyes, forehead, nose, and mouth can be smoothed with this simple process. Deep laugh and frown lines can be minimized. 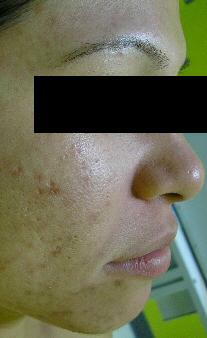 Even lingering effects of chicken pox, acne scars, and superficial abnormalities can be successfully treated. Immediately after laser exposure the treated area will turn pink to red and may swell slightly. In the following days the outer layer of skin will flake off as new skin is generated underneath. Recovery times are directly related to the depth of the peel and your body's healing response.